Disclosure: I was not compensated for this post. This post includes affiliate links. Opinions expressed are my own. One of the items on my growing to-do list is to sign up for a Craftsy class. I’m just trying to figure out which one I want to take. Craftsy is a an online community offering 360+ classes on a variety of subjects like baking, sewing, cake decorating, knitting, photography and more. I’ve been eyeing their online cake decorating classes. I made a pecan cake this week and it completely flopped! It tasted ok, but looked just awful. There was no way I could try and salvage it. 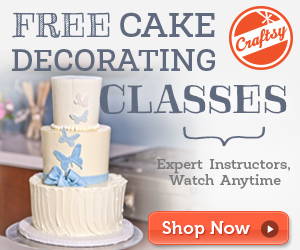 Take a peek at the Cake Decorating Classes that Craftsy offers. I’m trying to figure out which one would be best for me to take first. Perhaps The Wilton Method®: Baking Basics which is geared for beginners or maybe the Cake Topper Techniques? The classes are all very affordable and you do them on your own time. I love that your access to the class material never expires. The Craftsy Guarantee is also pretty great. Besides access to the material never expiring, you’ll also have a 100% money back guarantee if you aren’t satisfied and you don’t have to be tied down to any timeline. You watch and learn when it’s convenient for you! I encourage you to poke around and check all the classes offered. My to-do list is growing now! This is awesome, i took a class once and loved it! I’ve always wanted to get better at cake decorating but have no time to get out of the house. This would be perfect! this sounds awesome! My cake decorating skills are always a total fail!